We are a dynamic catering company with 38 years’ experience in the food industry. We are very passionate about food and it shows in our work. We take great pride in our products. Living on a farm gives us the opportunity to grow our own herbs, edible flowers and tomatoes. We also produce our own maple syrup. In past years, we have taken care of the prestigious gala event remembering military veterans known as Peterborough Remembers. We have also taken part in the fundraiser Global Angels and the Peterborough Airport Restaurant’s National Aviation Day for Women event. We also provide food to the Peterborough Speedway’s large annual events, especially the Autumn Colours Classic. We strive to ensure every event we cater is seamless and memorable for our clients, as we want them to talk about how great it was to do business with us! 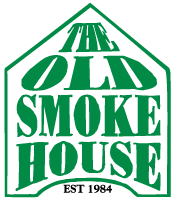 For the utmost in professionalism and personalized service, we encourage you to explore The Old Smoke House difference in catering today. But you don’t have to take our word for it – view our testimonials from satisfied customers just like you! As a catering company with 30 years of exclusive catering experience servicing Peterborough and the surrounding area, The Old Smoke House makes everything from scratch, including our own heavenly desserts. Striving to really listen to each client to see what they want, we tailor our catering menus individually to ensure your specific needs are always met. We assist people with planning events and logistics, providing a very personalized catering experience like no other. Our primary focus is to please you, so we’ll do just about anything in our power to ensure your event is flawless. As a small but efficient catering company that places a high emphasis on exceptional service and presentation, your catered events are always treated as a grand affair. Although we specialize in larger group catering for 40 people or more, we can also handle drop-off meals as well. We will supply everything needed for the buffet table, cutleries for the guest tables and wait staff. Contact us for a free consultation and/or estimate!